Some time ago I decided to write a file sharing app for kde, and then began hunting for some server already implemented in the libs. To my surprise, besides the fact that I found some HTTP server implementations (KGet, KTorrent and Amarok all use this in some way), none of them were suitable for my needs :/. Their main problem is the way these servers gets the content to be served: all data must be sent at once, within a single function call. This is great when you only serve small data, but I bet you wouldn’t like to serve a multi gigabyte (common case for my app) file using a server like them. With no server in hands, I began my own implementation, which supports large transfers without eating all system memory. This is somewhat like file reading: you fetch just a small chunk of data at a time, process it, and only then you request more data. This is a bit harder than reading everything at once, but also a lot more scalable. So I got a working server and a working application (kpws, in playground -> utils), and the I found another application, Kepas, which does almost the same thing I just wrote. This made me stop my own app for a while, because I think KDE will benefit from having a single HTTP server implementation , just like it have a client one, and I’d like to write it as a GSoC project, but first I need to gather some feedback from the other developers, specially the ones from the applications I cited here. Do you think this will improve security, performance, maintainability and code reuse? Would it be a good GSoC project? Since some people have asked me for the pdf , aulausp it is. I wrote this post a month back, but just now I have decided to post it. Well, some weeks back i commited an initial project for plugins on Rocs, and it’s almost finished… but i had a question about life, the universe and everything: Why i took too long (3 weeks) to put it to work ? Second, I started with QtPlugins, It worked very well! But, and it is a big but, how will Rocs know the location of the installed plugins? since plugins are shared lib loaded at runtime, I had to make this work somehow. So at IRC, #kde-dev, Rakuko told me something about KServices, unknow by me till then. So, with a little search on the KDE api, i found the rigth way (or KDE way) to make it works flawessly. After some hack. i had a problem loading the plugins, they were found in the system, but not loaded… So i started to look at other plugins (from kopete for instance) , Plugin example from kdevelop (What if some KDE programs where closed source? Maybe i will be still boring people at IRC to resolve that =). But it worked, compiled in a charmingly and cute way, then I forgot to work on them for another week. Until the end of last week Rocs was compiled with static libs, so Tomaz made a shared lib with core classes, including plugin manager and interfaces and i went back to hack today. Looking at TextEditor plugin example, i saw 2 things that i have not noticied back then: use of library export (KDE_EXPORT/KDE_IMPORT) and use of explicit at contructor, both at interface class declaration. Now Rocs have import/export and initial tools plugins suport. In next post i will give all the needs to write your own plugin… by now take a look in this screenshot of import/export and a set of nodes with some properties. to be plaied with a harmonica in C.
instructions on building your own blues here, and since I don’t know how to write in english so well, I used lot’s of small blues to compose this one. freely based on Tutti Frutti, from Little Richard, From the Bottom, by the Blues brothers, and other songs that I like. We’re so glad to see so many of you lovely people here tonight, and we would especially like to welcome all the representatives of KDE Girls and Womans, community that have chosen to join us here in the Planet KDE Ballroom at this time. We sincerely hope that you all enjoy the show and please remember people, that no matter who you are, and whatever you do to live, thrive and survive, there are still some things that make us all the same: The love for technology and freedom. you, me, him, them — everybody, people, everybody! While I don’t succeed, she will keep being a gnomie. I know a girl, named jojo, she taked care alone of almost twenny hackers in a row. This one’s from KDE and she has a cute heart. Cant program or play harmonica, but knows her way to do her stuff. Ahaaa, likes to brush bits and enjoys a night out. and when she talks, everybody feel high. She’s learning to program and doing it right. I’m gonna put her on a 36h crash course into KDE in just a few nights. Or Flight, in about 2 weeks the First Akademy in Brazil will be setup, I will finally met some of my fellow hackers ‘n developers for the first time. Since Sandro and Piacentini already wrote what the Akademy Br is all about, I will absent myself from that and instead, write about the people that will be there. Friends from Old times and new friends coming up and helping eachother. This group will be represented by Amanda, Felipe, Lamarque, Daniel and a few others. 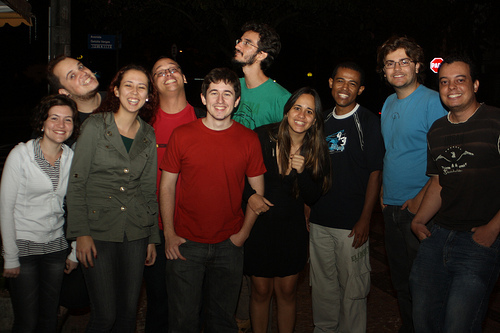 this is the “Promo Group” in Brazil, but not just promo, Lamarque and Daniel are programmers and help KDE when they can. In the persons of Wagner Reck and Camila Ayres, Wagner is already a KDE Contribuitor working with me in some KDE – Edu programs, Camila is a Wannabe KDE Hacker, and to fulfill that dream, she was also one of the ones that took my Crash Qt Course last Weekend. This last week I was in São Carlos, at the Universidade de São Paulo ( USP ) to give an introductory short – crash course ( 16h ) of Qt in 2 days. A Whole saturday, a Whole Sunday of geeks, nerds, and stuff going out. I spent the time that I was (supposedly) resting at the Tureba’s House, a cool place to be, with a Cool dog to play. The course was great, a little less of the total amount of subscriptors appeared, as usual. I had about 30 studants in the Saturday and 28 in the Sunday, wich I consider to be quite a Success. I also used the time on the course to talk about Summer of Code, KDE and Managing a OpenSource Project, I hope at least one or two of them will try Summer of Code this year, on a kde-edu related project. Hello KDE Comunity, my name is Vitor. 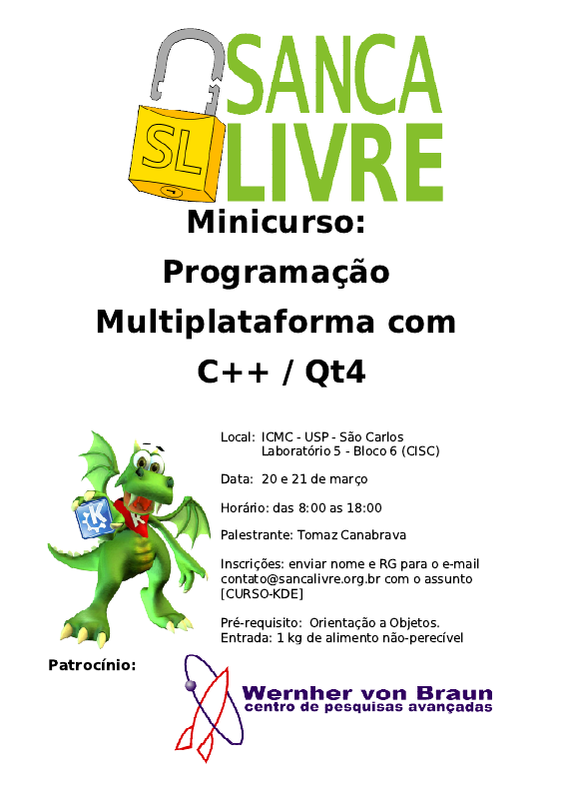 I’m almost (if I have some luck xP) finishing the CS course of the University of São Paulo – Brazil.At the university I’m a member of the Sanca Livre, a group dedicated to the spreading of Free Software, which currently act by the promotion of training courses, talks and travels to events related to Free Software. On the academic background, I got some experience on robotics, genetic algorithms and FPGA’s, besides the plain CS course. At the professional side, I work on automotive realtime systems (lots of assembly and low level stuff). My first contact with Linux and and open source in general was quite some years ago, using the Conectiva (a brazilian distribution, now known by the name Mandriva). Since then, I’ve been using it in servers, but it was just in the last few years that I really began using it as my main desktop system, and since then I’m more and more involved with Free Software as a developer. In the past, my contributions were limited to small patches and bug reports. I always spent a lot of time reading technical articles about many projects, notably from KDE 4 serie, but had never seriosly developed for any of them. So I began to talk to Tomaz, in order to bring him to my university as a teacher for the Qt training course he blogged about some time ago. It was talking to him that I decided to publish a personal project (it’s hosted in the KDE playground -> utils -> kpws), and develop it as an open project, marking my first serious work on the Free Software community. Besides this project, I’m planning to find something to work on related to Plasma and KDE Games. 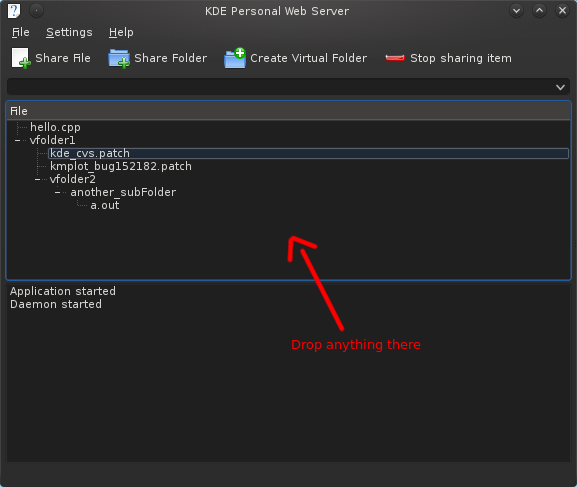 KDE Personal WebServer, or kpws, is being written to provide a easy way to transfer data from KDE to any device connected to the same network, without relying on any OS specific software/protocol. This is achieved by means of the HTTP protocol, which is natively supported by anything having network connectivity. The idea is to handle as many mime types as possible, so that the user can drop anything (files, folders, plasmoids, text, and so on) there, and the software will create a page to render the relevant content to the client, or in case of files, simply send it as a simple download, making it instantly accessible on any device with a browser. At the state, there’s no drag and drop support, it can only share files/folders, and the ui is… well, a bit ugly. The code was done to support many types of objects, so it shouldn’t be so hard to make it share other things. There’s however, many work to be done on the integration with KDE, UI beautification and a lot of polishing on the core classes, so I’m gonna write another post showing the technical side of the project. I’m looking forward to work with you, guys, and would like to thanks Tomaz by all the support, motivation and of course, the Qt course this weekend. The KDE Brasil community is happy to announce the first official Brazilian KDE meeting – Akademy-BR 2010. 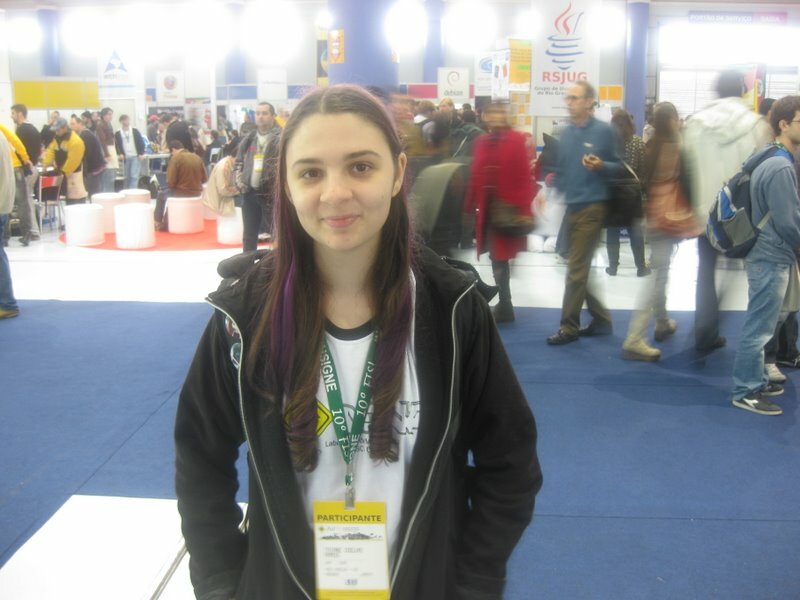 As a consequence of an increasing Brazilian participation in KDE projects related to coding, artwork, translation, and promotion, some efforts have been doing last years in terms of travelling for Qt/KDE talks and courses, supporting new contributors, and leveraging the KDE presence in events like FISL and Latinoware. We’ve seen a number of regional KDE groups appearing in Piauí, Santa Catarina, Rio Grande do Sul, São Paulo, and Minas Gerais, formed by amazing guys who are already doing some contribution to KDE. Previous in-person meetings in FISL and Latinoware, where focus was driven to talks, booths, and user group sessions, have demanded the organization of an official KDE Brazilian meeting devoted to some short talks and basically focused on hacking (that includes artwork/translation/promotion) sessions. Akademy-BR 2010 will take place in Praia do Forte (Fort Beach), a pleasant and small touristic village near Salvador – Bahia, from 9th to 11th April. We are thirty participants from distinct Brazilian states staying for three days in the Praia do Forte Hostel and doing our best to make KDE contribution more accessible to newbies, to narrow friendships, to make KDE applications rocking, and to plan our expectations for KDE in Brazil during 2010. I’m trully sad now. One of the cartunists that I admired the most was killed today by somebody that used to go to the same church as him. Glauco was one of the most brilliant, subversive and original cartunists in Brazil for a long time. I used to read his stories ( hidden from my mother, the cartoons where for adults ) since I was 6 years old. He influencied my humour style, My jokes and also my way of seeing things in life. I will really miss you man. Have you seen pereira? - Yeah, we marked to bump in the next corner. "So.. yah, A pizza." - "Good, anything to drink?" - "MILK!!!!" "Hey, how's the couple?" - "Ah, I missed you." - "Enough!" The KDE Community is growing really string here in the south part of the globe, with the efforts of Sandro Andrade and his Class ‘how to survive helping opensource projects’ in UFBA ( Federal University of Bahia ), Wagner Reck changing minds of professors and students in Rio Grande do Sul – making them try and use oss applications ( kde & non kde included ), Amanda, Lamarque, Felipe and everybody from KDE – MG doing an amazing job in Promoting the K-brand and a lot more. I Started giving Qt lessons back in 2008 at LatinoWare, when Piacentini invited me and Sandro to go there and talk about Qt and KDE development, so it’s almost 2 years that I have this blessed job. Usually my Qt classes have 5 to 10 students, and I was pretty confident with my class and knowledge of basic to intermediate Qt. I wanna thank the USP ( University of São Paulo ) for the opportunity to be there as a tutor for a weekend, and also Wernher von Braun for my air ticket, that will make this small 20h course a brigth possibility.